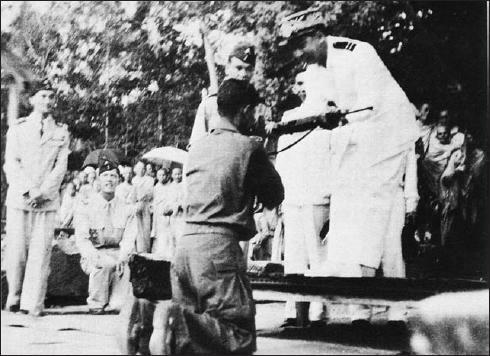 Top: Picture of Prince Chantaraingsey and (below) scene of Dap Chhuon handing over his weapons to Prince Sihanouk in a defection ceremony in 1950. This is the third of a four-part series of a biography of Prince Norodom Chantaraingsey. This biography was compiled by Mr. Hass Savoeun, a member of the Buddhist Khmer Center in the USA (http://www.ibuddhi.org/about.php) and was republished in the website of the Khmer Center in Switzerland, adding the front page picture by Lok Ly Diep of Angkor Borei News in the USA. The biography is translated from Khmer to English by Khmerization. Previously I cited Mr. Hass Savoeun as a member of the Khmer Center in Switzerland. He is in fact a member of the Buddhist Khmer Center in the USA. I wish to thank Lok Perom Uch for bringing to my attention about my erroneous citations. I thank him for his correction and wish to apologise to all concerned for my errors. E.(1). The Break Up of the Committee for the Khmer National Salvation Chapter One. The Committee for the Khmer National Salvation Chapter One had disintegrated after Prince Chantaraingsey’s group was sent to launch an unsuccessful campaign of sabotaging the economic interests of the government and after his group formed their own Committee for the Khmer National Salvation Chapter Four. Dap Chhuon, who commanded the biggest group of the Issarak fighters with the rank of a 7-star general, in the northern region, defected to the government of Prince Norodom Sihanouk in September 1950, through In Tam who acted as an intermediary. Kao Tak, who was Dap Chhuon’s deputy, took over the rein as chairman of the “Committee” Chapter One. But may be because Kao Tak wanted to split from Leav Keo Moni or may be he wanted total control of the movement, one day he invented the story that the Thai authority had confiscated all the weapons that he had purchased for the movement. In fact he diverted those weapons to hide at Phnom Kla Kmum (Bear Mountain) in the Dangrek Ranges in order to arm his secret army which was training secretly to prepare for a party coup d’etat to topple Leav Keo Moni as a president of the movement. This trick was uncovered by Leav Keo Moni beforehand and was thwarted. Leav Keo Moni convened a major meeting at Tropaing Prasath by inviting all concerned, including Kao Tak. In the meeting Kao Tak was stripped of his position by a unanimous vote. The meeting intended to replace him with Achar Bou but the official declaration of the appointment as a commander had been postponed or had not been publicly declared. Upon Kao Tak’s return to his base through Sre Noy Pass, Leav Keo Moni’s group sent a death squad to assassinate him. When Kao Tak’s group reached Stung Pongro riverbank, east of Tram Sorsor at Chroy Ta Nguon, Leav Keo Moni’s death squad caught up with his group and opened fire, injuring one of Kao Tak’s thighs. His bodyguards returned fire. His secret army, which was based west of the riverbank heard the gunfire and came to his rescue. Angry with his assassination attempt Kao Tak ordered his men to dig up all the hidden weapons to take revenge on Leav Keo Moni. 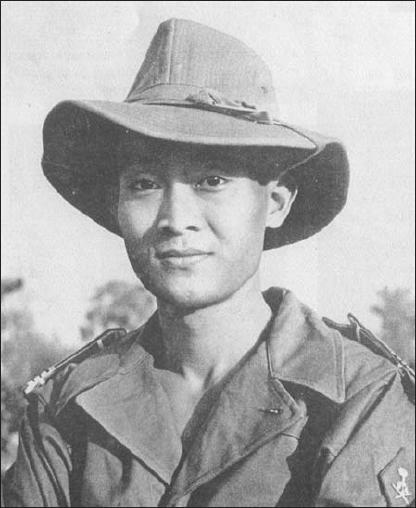 His group attacked and razed Leav Keo Moni’s base at Anlong Veng in Tropaing Prasath at the foot of the Dangrek Ranges. Leav Keo Moni was forced to flee to Battambang by travelling through Kralanh Teuk Cho, Sampov Loun, Anlong Sar, Bakprea toward Ta Lay Jayamongkol’s base at Prek Trop and then to Stung Chass through to Veal Bek Chan with Mr. Ny Vanthy running after the horse as his baggage carrier. When he arrived at headquarter of “Committee for the Khmer National Salvation Chapter Three at Banon in Battambang which was under the control of Ouch Nilpich, Leav Keo Moni ordered his military commander to join force with Ouch Nilpich’s group and went to take a revenge on Kao Tak’s group. But Ouch Nilpich’s troop was defeated by Kao Tak’s troop and retreated back to their base. Leav Keo Moni lost hope with Nilpich’s group so he decided to disband his group and joined with Sieu Heng’s “Viet Minh’s Khmer Issarak” or can be called simply just “Khmer Viet Minh” which was a communist leaning movement controlled by the Communist Party of Vietnam. As for Ny Vanthy, he defected to Prince Chantaraingey’s group and later became his trusted confidant. E.(2). The Internal Split of the Committee for the Khmer National Salvation Chapter Four. Among the members of the Committee-Chapter Four of Prince Chataraingsey‘s group, Hem Savang was one of the most experienced and able military commander who was relatively well educated but he was unhappy with the leadership of the Committee-Chaper Four led by Prince Chantaraingsey. So he devised a secret plan to assassinate the Prince but his plan was discovered beforehand with sufficient evidence. Prince Chantaraingsey was forced to sentence him to death in accordance with the internal rule of the group. Another leader, The Robber, of the Issarak movement named Puth Chhay, who was based in Kampong Chnang and northern Kandal provinces, was also angry with Prince Chantaraingsey because his group was always under constant attacks and disruptions from Prince Chantaraingsey’s group, especially in the regions of Srass Klaing, Ong Kmao in the present day Samrong Tong district and in Oudong. He sent his military commander named Seap, along with his 30 troops to join Prince Chantaraingsey’s group. Seap was a man of dark skin, with firm build who liked to wear only a pyjama-type trousers without wearing anything on the top in order to show off his magic bracelet bearing the idol of the holy cow with big diamonds planted on it. He was a brave military commander who was always leading his troops to the front line without fears of death. So his defection to Prince Chantaraingsey’s group helped the Prince to expand his territory beyond his previous realm. Seap always took his two wives, one was a Khmer woman and the other a Vietnamese, to every battlefield he fought. The Prince grew to love Seap very much because of his military successes on the battlefields. He knew that Seap must be very tired and exhausted so he sent a messenger to invite Seap to return from Koh Kong to take a rest at the base in Kraing Makak. While the Prince grew to love him and greatly admired his bravery, one day one of the Prince’s soldiers accidentally received a letter from Puth Chhay which was sent to Seap, to remind him to kill Prince Chantaraingsey as quickly as has been planned. Seap did not know that his plan was uncovered. His plan was discovered after he had returned from Koh Kong. Without knowing about Prince Chntaraingsey’s plan to kill him, he was celebrating his military successes by partying seven days and seven nights with his comrades-in-arm at Kraing Makak village in Chbar Morn district. The Prince selected only those soldiers who were experienced combatants. However all those combatants were very scared when they heard that they were going to fight against Seap because they have seen his military prowess before. When Seap and his cohorts were asleep, those who were assigned with job of assassinating Seap have surrounded his place of party with three layers of defence. Seap was a very cautious person. Even though he was very drunk sleeping upstairs he still come down to wake up his men and reminded them to be on guard. He even put each person to guard each step of the house. Because they were drunk they were sleeping while on guard, allowing Sok Seng Roeung Mony and Ny Vanthy to slip through the defence to go behind the house where Seap was sleeping. May be due to panic or fears, one of the assailants accidentally triggered the gunfire waking up Seap. He ordered his men to fight back. He jumped off the stilted house and sprayed the bullets with his automatic gun causing the assailants to duck for cover. The two assailants who were hiding under the house fired one, two and even three shots at Seap but the gun was jammed. Seap, along with his Vietnamese wife and a numbers of his men, escaped because no one dared to block his escape route. His other men and his Cambodian wife who survived the onslaught, along with his magic amulet, were captured. Prince Chantaraingsey’s campaign to assassinate Seap was considered a success even though it was not successful in killing or capturing Seap himself. On the 9th of October 1951 Son Ngoc Thanh had returned to Phnom Penh after he was arrested and sent to exile in France by the French authority in 1945. After he had a meeting with his ex-comrades-in-arm and after the welcoming party at Kok Meng Restaurant he decided to escape to join his ex-colleagues in the Dangrek Ranges in order to re-unite all the splintered Issarak groups by taking Kao Tak’s group as a core and base group. This time the Issarak group was re-named “The People’s United Issarak Movement for the Khmer Salvation”. The prominent members of this movement were: Son Ngoc Thanh, Kao Tak, Ea Sichau, Hang Thun Hak, Korm Reth, Iv Yang, Lek Sam-Oeun (alias Morning Star), DuongChan Sarath (who was an ex-government officer who defected to Son Ngoc Thanh by bringing along with him many of his soldiers). This movement also included other three autonomous groups of Prince Chantaraingsey and Savang Vong ( these two groups volunteered to take orders from Son Ngoc Thanh but still maintained their armed groups and their autonomous regions of control independently). Nguon Hong, who was based in Kampong Thom province had defected to Son Ngoc Thanh’s movement entirely, bringing along with him all his fighters. This new movement can be considered to be the next new generation of the resistance movement which called themselves “Khmer Issarak” and which can be considered as a “Fourth Khmer Issarak Resistance Movement”, by maintaining the old leadership from the “First Khmer Issarak” movement.//(To be continued in part 4:http://khmerization.blogspot.com/2008/01/prince-chantaraingsey-as-military.html). >What a concept! Beautiful.. Remarkable … I am impressed!